A thousand years ago, Native Americans flourished on the peninsula that is now Monterey, Calif. They thrived on the area's natural bounty of plants, wildlife and seafood. The peninsula teems with that same abundance today, and Monterey County is often called The Salad Bowl of the World, because it produces such a large quantity and variety of California's vegetables. From local vineyards to the area's famous abalone farms, a legacy of plentitude permeates the social and recreational fabric of this fertile region. Take, for instance, the Carmel Valley Ranch, a lush resort in a niche of rolling hills at the base of the Santa Lucia Mountains. A few miles inland from Carmel-by-the-Sea, it's like a little Xanadu for elite vacationers, or a Camp David with a West Coast twist for business summits. On nearly 500 acres of green hills and woodlands, this resort was designed to be a luxurious outpost of modern amenities surrounded by rustic beauty. The California Grizzly Bear used to roam freely here in the cool mountain air of the Santa Lucias, and these days guests have been known to spot wild turkey and fox on the estate in the early morning. The hotel lodge — a vintage, 1890s ranch house — has only 139 luxury suites (averaging 800 square feet), which have been completely redone in a contemporary style whose natural colors are in harmony with the surroundings. From the warm, studio-style Santa Lucia Suites to the extravagant, two-bedroom Carmel Suites, every accommodation includes a travertine fireplace, private deck, spa bathroom and amenities such as complimentary Wi-Fi, flat-screen TV with Blu-ray player, iPod docking station and bath amenities made from lavender harvested right on the property. Floor-to-ceiling windows overlook the mountains or the resort's sweeping, manicured fairways. The entire peninsula is populated with golf courses, and golf culture is as profuse as the fish specials on local menus, so the Carmel Valley Ranch spared little expense to make sure their fairways are among the most sumptuous. Pete Dye's original par-70 course design has been restored to take full advantage of the diverse terrain. The air here is fresh and the breeze is crisp, keeping temperatures comfortable even in the California sun, and the greens meander through the hilly landscape with mountain views and a woodsy aroma, making it a pleasant eighteen holes to walk. Still, most players whiz around the championship course in club carts. Caddie service, a rental center, driving range and on-site pros are just a few of the extras that make golf vacations a longstanding tradition here. For many years golf was the main draw at the ranch, but it now features numerous other activities. The resort has its own Pinot Noir vineyard, and on-site beehives give guests the opportunity to participate in honey harvesting. Spa Aiyana sits adjacent to the lodge and, along with a beautifully situated yoga platform, offers treetop views. There are also a saltwater pool, infinity edge hot tub, kids' splash zone, basketball court and, most notably, a popular tennis center with clay and hard courts, and a lowered center court and observation terrace for big games. The pro shop offers private lessons and can match you up with a player of comparable skill. Aside from tennis matches and swing sets, you can go hiking, biking and running on trails that twist through the wooded surroundings. And whatever you choose to do, it will help you work up an appetite for another big Carmel Valley Ranch attraction: the eating and the drinking. 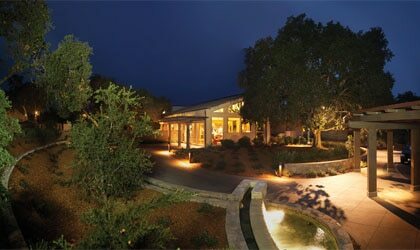 The fine cuisine of Monterey and Carmel-by-the-Sea are a quick drive away, but most guests make reservations at the lodge's signature dining room. Chef Tim Wood has built relationships with local fishermen, farmers and artisan food producers, and he uses ingredients from these people — along with produce from the ranch's organic garden — to craft his sophisticated menu. His skills cross over to the Adventure Kitchen, an interactive cooking space available to all guests, but which is particularly popular with groups, who come to the resort to take advantage of its unique event spaces and wealth of activities.